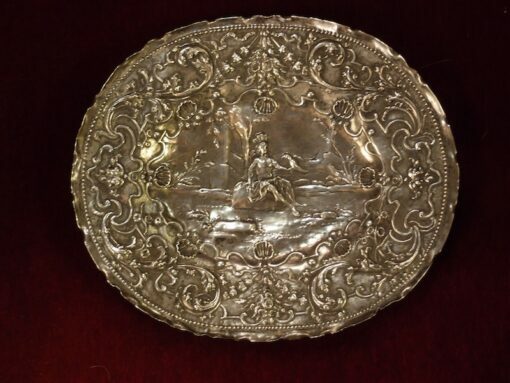 This is a rare piece of late 17th/early 18th century silver. Paul Solanier was accepted as a Master in 1665, and married the following year. There is a square platter of about the same period by Solanier in the Metropolitan Museum, New York.? Our platter is repoussed in typical Louis XIV style with symetrical arrangements of garlands, scrolls, shells, ribands and strapwork. The central figure with a parrot and a feather head dress is emblamatic of the continent(s) of America. The platter weighs 187 grams and is 27.5 cm wide and 23.4 cm tall. Hallmarks lower left rim. ?